Day 319: The Well Runs Dry . . .
What a day. . .a ‘quick’ trip to Kerrville to have an appliance repaired turned into an all day–wait and see–and thus absolutely killed what promised to be a busy Tuesday. You know those days. . .they start full of promise and high energy. You’re focused on what needs to be done. You’re “relatively” excited about getting them done, and you know that the sooner you get them DONE, the sooner you get to go home. Today was that day. . .Brian and D#1 were going to meet a repair technician with a window of 8 am to Noon. Since very rarely does a repair person actually arrive at 8, we knew that there was some time to kill before getting to the house. A very good use of time was stopping at Rita’s for some awesome breakfast tacos. Yep, nothing better than starting your day with a couple of bacon-egg-potato and beans breakfast tacos washed down by a cup of coffee! Getting to the house a little after 9:45, we knew that the window of waiting was only going to be a few hours more–of course,there’s always a chance that the repair person came before, but highly unlikely! When 10:00 gave way to 10:30, we suspected that something was up. . .a quick call to the customer service hotline confirmed that they were running behind schedule. . .new time was 1:00 pm. So, it gave us the opportunity to run some errands and make lunch arrangements. Daughter #1 with a friend from high school and Brian with good friend and former co-worker, Guy. It’s always a good meal at Mike’s Mencius Chinese Restaurant, where the conversation was dominated by the upcoming NFL season and the approaching fantasy football draft. We were joined by Guy’s son, Connor who has become a fine young man–graduating from college and getting ready to move forward with his life. And tonight, we wrap up Malbec Week with our final Malbec (of the week – chances are another will sneak into the basket before August 31st and we put a bow around this puppy!) Now, we’ve had this one several times before over the past couple of years and it has a really great track record of flavor, full-body and quality for the price. Previous vintages that we’ve enjoyed include the 2009, 2010 and 2011, and tonight we sampled the 2012 Pascual Toso Malbec from Mendoza Argentina. Priced below $10 a bottle, you might be fooled into passing it by on the grocery shelves. . .those who only prefer high-priced wines from wine or liquor stores might want to stop–look around to make sure no one is looking–and drop a couple of bottles into your cart! The Reserve is amazing but this wine is still one of the highest rated malbecs under $20. 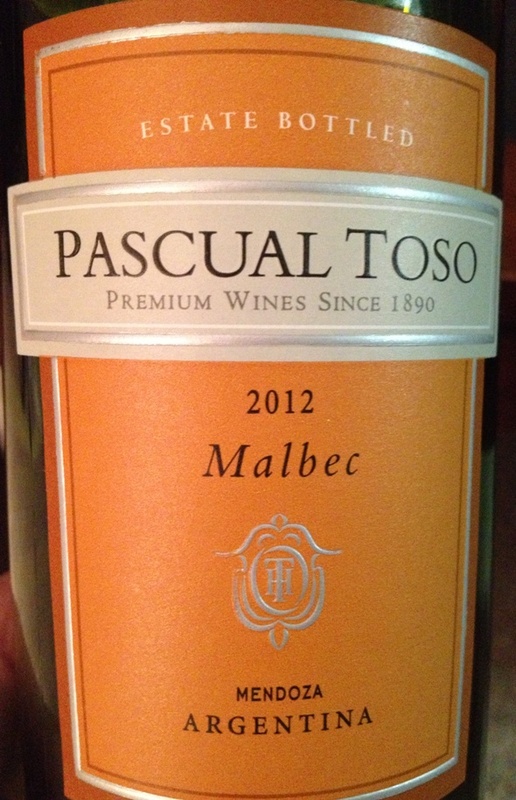 Pascual Toso is one of the oldest wineries in Argentina and has a long history of making excellent wine. For the Malbec, the winery combined its efforts with legendary winemaker Paul Hobbs whose wines usually retail in the 100s. The nose of this wine greets you with notes of plums and a hint of oak. The wine is fruit forward with a finish that brings blackberry, licorice and vanilla towards a sweeter, soft finish. Words like smooth and elegant spring to mind as you contemplate having another glass. It does go down easy so you might as well pick up a bottle or two. But, at the end of today. . .there are no more malbecs for the reviewing. . .at least not for Malbec Week! While we accomplished one goal, many were left untouched which brings us to the end of another day. Ultimately, we’ll either get the others done tomorrow or not, but it’s a reminder that we don’t always get everything we want–or need. We hope that as your Tuesday night fades to black, you’ll enjoy your favorite wine responsibly and remember to recycle whenever possible. Categories: Uncategorized | Tags: Home Repair, Kerrville, Pascual Toso Malbec | Permalink.